Congress has been passing legislation to grant immunity under varying circumstances since 1986. Each amnesty law has granted immunity to certain groups of people under certain circumstances allowing eligible persons to gain legal status in the United States. Current law allows people who are in the United States illegally to apply to change their status and remain in the county legally. Obtain the application. Contact your local branch of the United States Citizen and Immigration Services to obtain an Application to Register Permanent Residence or Adjust Status. The application comes with a booklet of instructions that will guide you through the application process and list all of the required documentation that you must submit. Determine your eligibility. You are eligible to seek amnesty if you entered the United States without the proper visa, or if you have stayed longer than your visa allows. The spouse and/or children of an eligible person are also eligible to apply for a change in status. File the application. Once you have determined that you are eligible, and have located the proper documentation, file the application as instructed. Once the application is filed, you will have legal status while your case is pending. Obtain a work permit. Most people will be eligible to obtain a permit to work legally while their cases are pending. This allows applicants to legally support themselves until a decision is made. This work permit will permit you to take advantage of social services available to American citizens and may enable your children to obtain certain benefits. Await a decision from United States Citizenship and Immigration Services. Carefully follow the instructions concerning issues that may arise during the application process and while your case is pending. For instance, you will not be permitted to travel outside of the United States without first filing for the appropriate permission. The failure to follow the detailed regulations laid out by the application instructions will result in the denial of your application and possible deportation. Consult an attorney. The status of the immigration amnesty laws are in flux, and it is important to contact an immigration attorney who can guide you through the process with up-to-date knowledge of the laws. Contact your local bar association to find attorneys who specialize in immigration laws. Lynn, K.. "How to Apply for Immigration Amnesty." 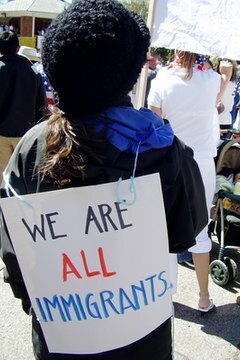 , https://legalbeagle.com/5982105-apply-immigration-amnesty.html. Accessed 21 April 2019. What Happens If You Marry an Illegal Immigrant?